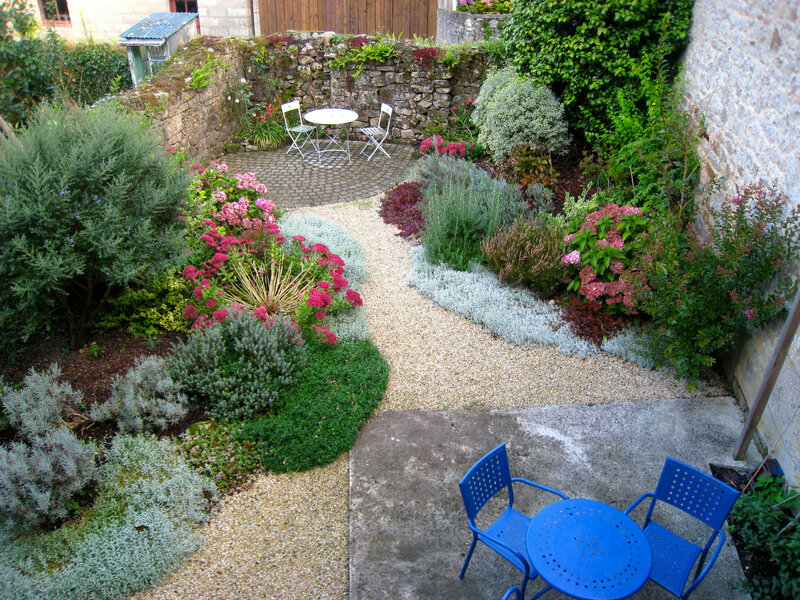 Romantic Cottage in Medieval Gueméné sur Scorff Sleeping 6 This character cottage, Petit Guémené, is located on a quiet side street in a market town of 1200 people right in the heart of Southern Brittany. 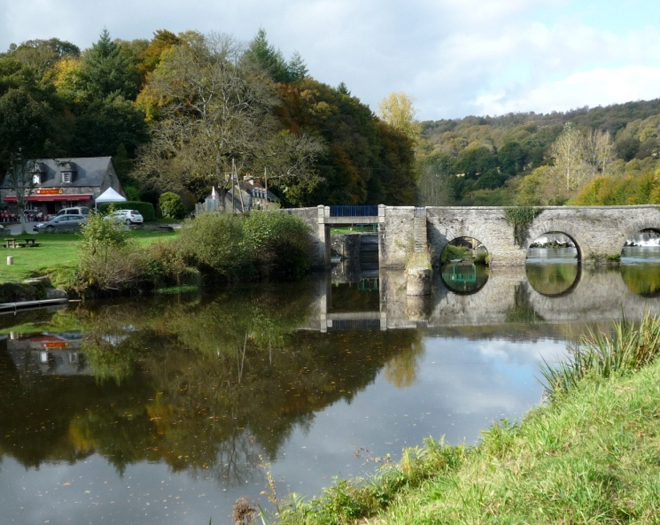 The cottage is a 2 minute stroll from the Scorff river and lush un-spoiled countryside. The cottage has been designed as an open-style format with original beams and chestnut flooring, a spacious living room, and a dining table for six with lovely views over the garden. The kitchen is modern and fully equipped, with a gas hob, electric oven, fridge-freezer and a microwave, as well as an extensive range of kitchen equipment e.g. toaster, filter coffee maker, electric kettle - ideal for entertaining or for long stays. Market day is every Thursday, the fresh seafood truck comes on Wednesday and there is an excellent supermarket within a 15 minute walk. 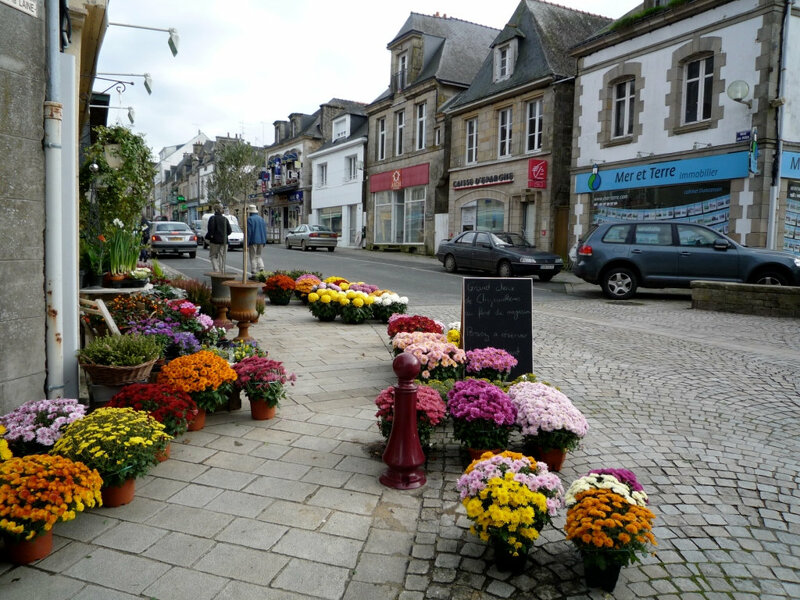 Lots of restaurants, créperies and bars in the town offer a wide selection, should you want the night off! It sleeps 6 with one double bedroom, one twin bedroom, one mezzanine single bed and on the ground floor one alcove single bed, a full bathroom, 2 toilets and a shower room. The original shutters, beamed ceilings and chestnut floors have been retained for a thoroughly romantic experience! On the top floor there is a full bathroom. On the garden level you will also find a shower room. Individual radiant heating allows for control of temperature on each level of the house; the loft, the main floor and the garden level. The lower floor of the house opens onto a completely secluded stone-walled garden, with 2 patio areas to enjoy an outdoor BBQ (provided). An outdoor dining table and chairs is found in the shed next to the cottage for outdoor entertaining as well as patio furniture and 4 quality mountain bikes to cruise the 100's of kilometres of the Nantes Brest canal towpaths, just 10 km away. A handy car bike rack is also available should you wish to wander further a-field. The cottage is Internet ready for your computer (WiFi) , has a VOIP phone for European and UK calling, and a CD player and CD selection is provided in the living room. There is also a washing machine tucked into the shower room. Linens and personal towels provided. J, S & E - Beautiful site, really comfortable. Beautiful part of the country & really suited to day trips…biking around was really fun! The K Family - Ireland - A lovely house in a very interesting town…enjoyed the local walks and cycled around the countryside The S family - Canada - hat a wonderful time we had. This house has been everything that we needed as a base to so many day trips. Loved walking along the Nantes Brest canal - great for cycling. K&K - England - Nice comfortable cottage and beautiful garden to the rear…great afternoon cycling around the country lanes following the river Scorff - lots of coffee and bars along the way. M - South Australia - I really enjoyed my second stay in Romantic with the menu de jour playing a significant part of each day! Many thanks for your great hospitality and information. P&P - Edinburgh - A very comfortable and well-appointed cottage with tasteful renovations and imaginative adaptations. Congratulations on the garden too.